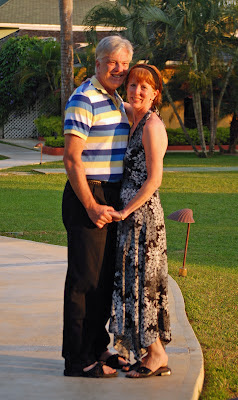 May 17th is Susie’s and my two to the fifth (32nd) anniversary. That both seems like an eternity and a twinkling ago. At one level, I can barely remember not being married. On another, it seems like just a mere moments ago that I walked down the aisle with my beautiful new bride. This picture pretty much sums up that day for me. I am not very good at smiling in pictures. Sometimes, I seem to have a snarl or sneer for an expression. At others, I have some odd facial contortion that I think is me trying to make a smile, but failing miserably. In this picture, however, my smile is genuine. And, big! 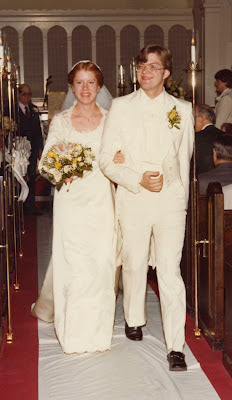 I realized that I had just gotten away with it—a socially inept computer nerd (before that was all the rage) had managed to marry the most gorgeous and intelligent woman he had ever met. Whatever my flaws, I had chosen wisely—thirty-two years later she is still the most gorgeous and intelligent woman I have ever met. I remember odd things from our wedding day. I remember playing tennis that morning with Susie’s brother, Tim. (For which she has still not quite forgiven me.) I remember how beautiful Susie’s smile was. I remember Susie’s granddad’s short sermon on the submissive role of the wife in front of a bunch of Columbia/Barnard women who did not disagree because he was so sweet while saying it. I remember our friends the Grizzles trying to sneak away from the wedding reception so there would be enough seats for folks who had shown up without sending RSVPs. I remember the bowl of flowers that was too large to sit on top of the wedding cake. I remember finding rice in all sorts of places that night. For all that the time has gone by so quickly, marriage is not always easy. Fortunately, both Susie and I are committed to it. We view love as something one does, not just feels. I believe that Susie is worth fighting for, worth sacrificing for. My job is to make her dreams come true. Sure, that is sappy, but I believe it and try to work toward that end. As this picture from our vacation to Jamaica last year shows, when I’m with Susie, I still have the smile of a man who knows he has gotten away with something. Gotten away with having a wonderful life with a gorgeous and intelligent woman worth fighting for. I’m looking forward to the years leading up to our two to the sixth anniversary!